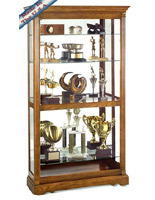 This Trophy Case with Cherry Finish is an Elegant Home Display Unit! 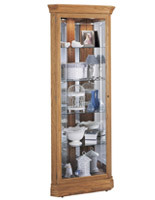 This Display Cabinet is Ideal for Professional Offices Too! 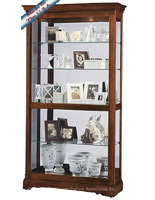 This trophy case, corner display cabinet, is perfect for showcasing sentimental treasures and keepsakes. 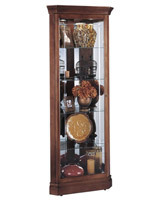 Howard Miller's corner cabinets are made from the finest glass and hardwoods with painstaking precision. This trophy case will become a treasured family heirloom as it is passed down from generation to generation. 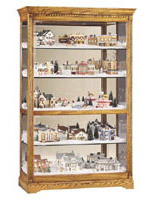 It is the ideal choice for use in a living room, dining room, family room, or parlor corner. 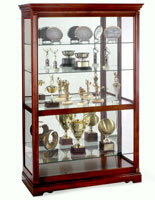 A No-Reach Touch-Lite located on the back of the corner trophy cabinet to provide easy access to lighting. Adjustable floor-levelers for stability on uneven surfaces. 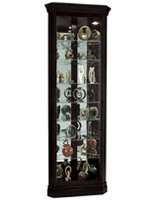 A locking glass door to provide easy access to as well as security for your collectibles. 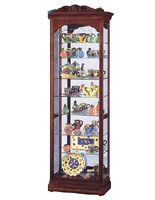 Fully adjustable glass shelving with Pad-Lock and cushioned metal shelf clips to add stability. Interior halogen lights provide a whiter, brighter, more natural looking way to showcase your items. 34.0" x 85.0" x 21.0"